THE WRITING BUDDHA - Opinions | Books | Movies: 101 Entry-Level Jobs by T. Muralidharan (Book Review-5*/5) !!! 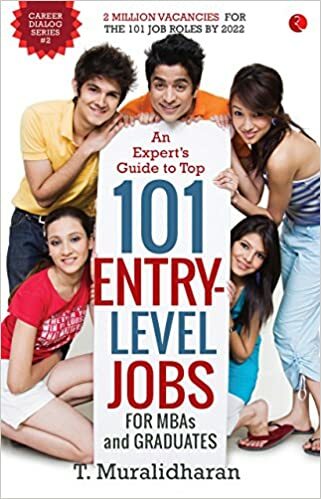 101 Entry-Level Jobs by T. Muralidharan (Book Review-5*/5) !!! Not many books are interestingly written when it comes to career or education. This is the main reason these books are never treated like other books by readers and you'll find them only in the bookstores at Railway platforms or bus depo. But then are always exception and one of them is the recently released book by Rupa Publications named "101 ENTRY-LEVEL JOBS" written by T. Muralidharan. Mr. Muralidharan is one of the India's top recruiters and career columnists so there could have been no better person to write something like this. The book discusses only the jobs that can be fetched as a fresher after earning either a Graduation or Post-graduation degree. The qualifications that are eligible for the 2 million new entry-level vacancies in the next six years are BE, BTech, BCom, BA, BSc, BBA, BCA, BPharm, BL, MBA, MCA, MBBS, CA, ICWA, CS and Diplomas. The author have explained various industries in which jobs are open for a fresher and he guides properly about what the industry works in and what many roles are going to be available in that particular industry as a fresher. Then he answer many questions such as what are going to be the responsibilities, skills that are required, stress levels, salary and future career prospects for each of the specific roles that the author discusses. Each and every designation is explained so well that you won't be required anyone else to explain it you in a better way. I also liked this book believable and written after a good research as the salary as fresher and after attaining the experience of specific years is rightly mentioned without any superficial amount. Author has not given any false statement throughout the book as per what knowledge I already had about few of the posts. Also, you might not find many designations that you have heard from your friends because they are not for Freshers. The Practitioner's view given after each job description by a person working in the same position is wonderful to read as it makes more clearer to us regarding what an individual gro through the years in that position. I will recommend this book to every student who is in 9th std or more plus I would like to ask parents to ensure that you have this book in your home as soon as your child reaches in secondary school. Someone who does not know where to venture can surely find an interest after going through all the industries and designations described in this book. I give this book 5 stars out of 5. Yes!! !